Console gamers will have access to a whole world of Skyrim user generated content if Bethesda gets its way. Although making mods for Elder Scrolls games will likely stay the exclusive purview of PC gamers, actually playing them might not be. Bethesda says that it is keen to get console gamers playing the mods for Skyrim alongside their PC brethren. Bethesda's Todd Howard said that the content made with the Skyrim Creation Kit would work on consoles just as well as it would the PC; it was, after all, the tool that Bethesda had used to make the game. The problem, Howard said, was that there wasn't an avenue for delivering the content to console gamers yet, but that Bethesda was talking with Microsoft and Sony in order to try and make it happen. Even if these efforts were successful however, he didn't think it would be something that would be up and running in time for the game's launch in November. ""We'd like to see it happen," he said. "Because it works, it's how we made the game. I think it's something really cool about what we do, but 90% of our audience is on the consoles, so 90% of our audience can't even see this thing. So if we can solve that we'd like to." Mods for previously Elder Scrolls games have ranged from simple cosmetic changes like more attractive maps and new eye colors, to new items and equipment, to complete overhauls of systems and mechanics. If Bethesda is able to bring mods to consoles, it would not only bring console and PC gamers closer together, it would significantly increase the scope and longevity of Skyrim. 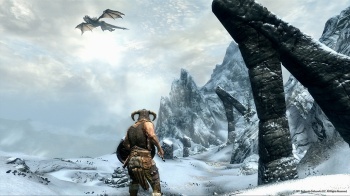 The Elder Scrolls V: Skyrim comes out for PC, PS3 and Xbox 360 on November 11th.